White/paper birch, black/sweet birch, and yellow birch all have edible parts. 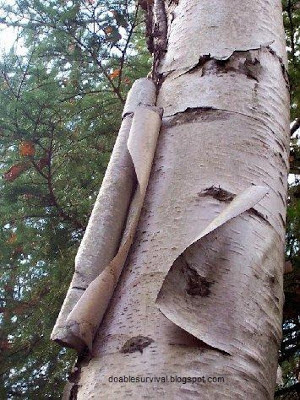 When talking about edible barks, it's not the very outside part of the bark but the inner part next to the wood that you want to get. 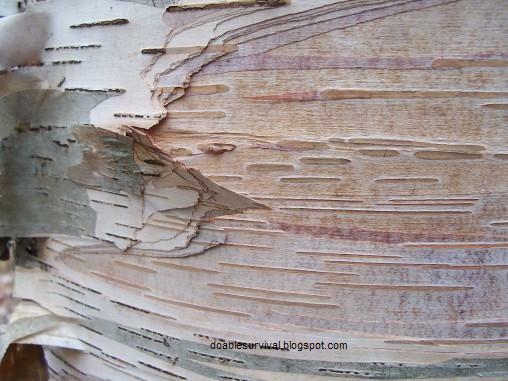 Birch bark can be eaten raw, cooked, dried, and beaten into a powder. It can be added to other foods like soup and even be used in bread recipes. The bark can be shredded in strips and boiled as "birch spaghetti". 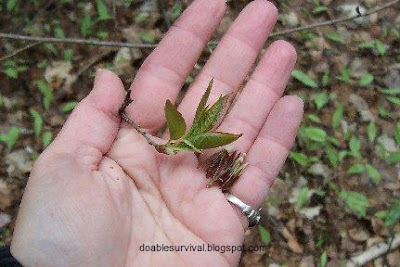 The bark, twigs, and leaves can be brewed into tea. Young leaves can be steamed or sauteed. 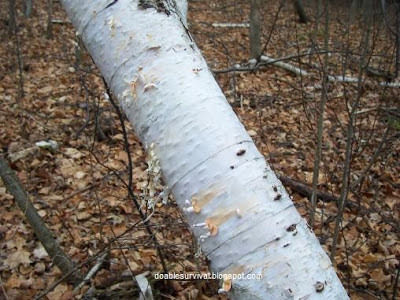 Birch has a wintergreen flavor, specially the black/sweet birch. 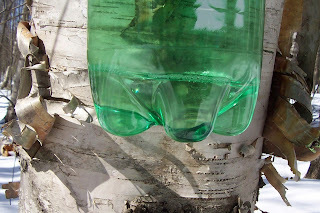 You can also eat the twigs and young leaves and buds (spring) of the birch tree, and the sap can be tapped and eaten raw or cooked. 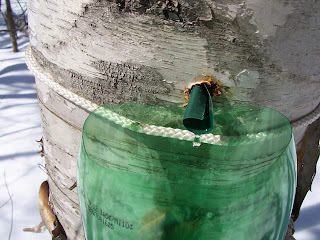 It apparently can be used to make a "birch beer" also. This is a large branch that fell recently. This is a large tree that recently died. See all the layers? off. It can be dried and ground into a finer "flour". for the sake of my blog. lol I added some chaga to it (see below). ...ummm..
nicely. 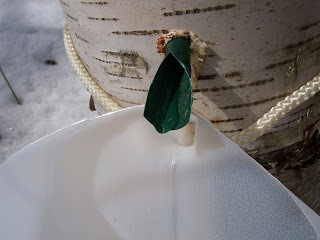 I used different containers, milk jugs, 2 liter pop bottles, etc. I like the smell of it when it cooks down enough that you can start to smell it. I don't know how to describe the taste. An article on Wikipedia says "rich and caramel-like, with a hint of spiciness". I think I would agree with that. 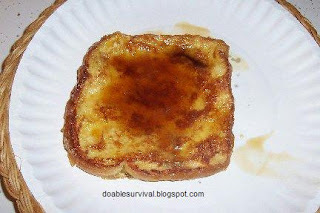 It has a bit more of a bite to it than maple. At least, that's how I think of it. Tastes more "wild" maybe? As far as "survival," it isn't very practical. 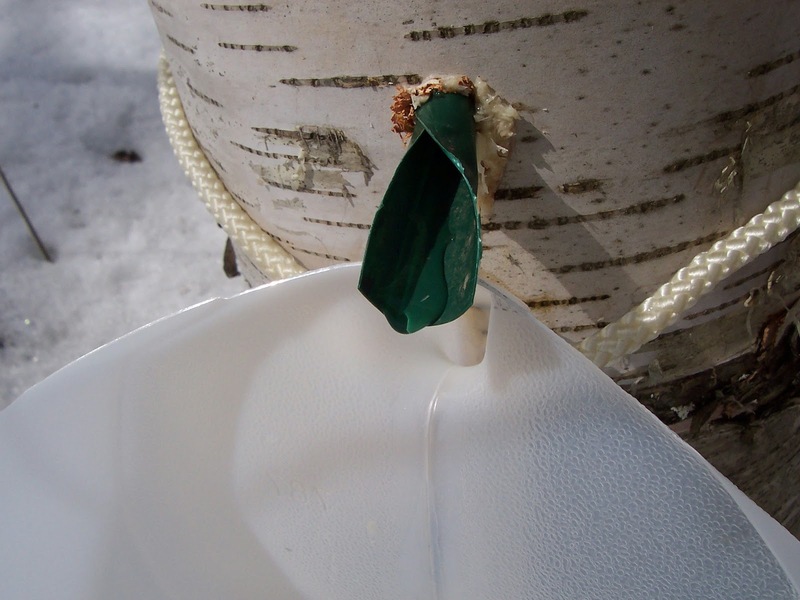 If you were lost in early spring when sap runs, you could tap a tree for water. If a person cooked it down over a fire outside, it wouldn't cost much to make. I made it in the house, which I'm sure used up quite a bit of energy. I cooked it for about 15-16 hours total. I didn't cook it on too high a heat because I read, if you boil it, it can get a scorched taste. 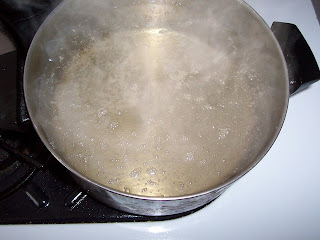 It actually didn't start to boil once the whole time I cooked it so it must not come to a boil too easily. I had about 44-1/2 cups. 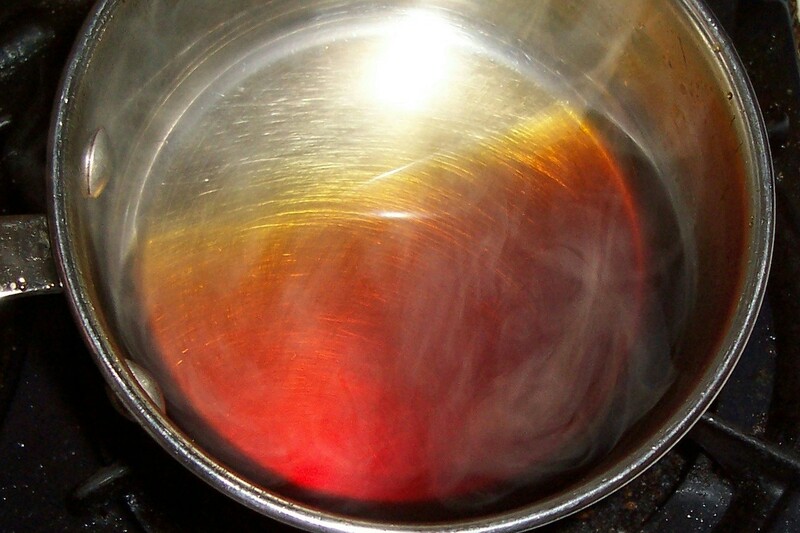 I filled the pot and then added to it as it cooked down. I strained it through T-shirt material before I cooked it and then had to strain it again after it cooked down quite a bit because it would get some small globs in it. 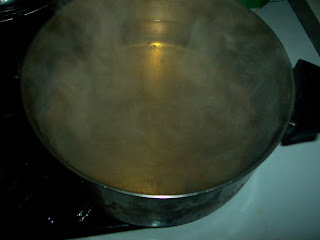 Once it was down to about a 1:100 ratio, it still wasn't very thick but I didn't want to boil it down too much either. I prefer to put my syrup in a small bowl anyway because I like my french toast to be as crunchy as possible and non-soggy pancakes. :) I just dip each bite and then eat it. Yum! Chaga is a fungus that grows on birch trees. It doesn't look like a fungus, at least not the kind we tend to think of. To me, it kind of looks like burned wood/bark on the tree. It's often called "tinder fungus" because it is great for starting fires. It is claimed to have tons of antioxidants and have a lot of health benefits. You can look up information if you want about it, but that isn't the focus here in this blog; but I'll share a few photos here that I took this summer. outside layer and use the brown corky part inside. Supposedly, the white lines inside have the most health benefits. tree itself. Chaga eventually kills the tree anyway. 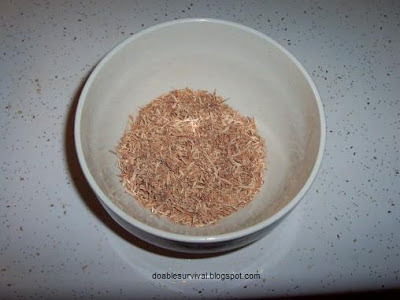 Just a couple articles I saw on the health benefits of chaga, which I don't know much about; so I can't say if I agree or disagree with this information (same with the birch articles below); but you can check them out if you would like. 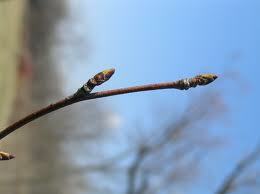 Here are a couple of articles talking about the health benefits of birch. Blend the ingredients and knead the dough. Allow to rise for one hour. Roll out into smaller rounds. Baking time varies according to the size of the bread. 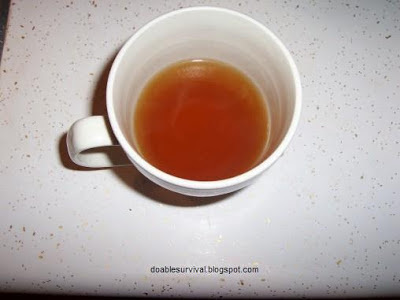 What does Chaga tea taste like? I saw you added to the birch when you made it to I think improve the taste. What does it taste like? Not sure how to describe. Honestly it just tasted like tea to me, but like I said I'm not crazy about tea so didn't like it much. It doesn't taste bad. I just did the two together because that's what the blog was about. 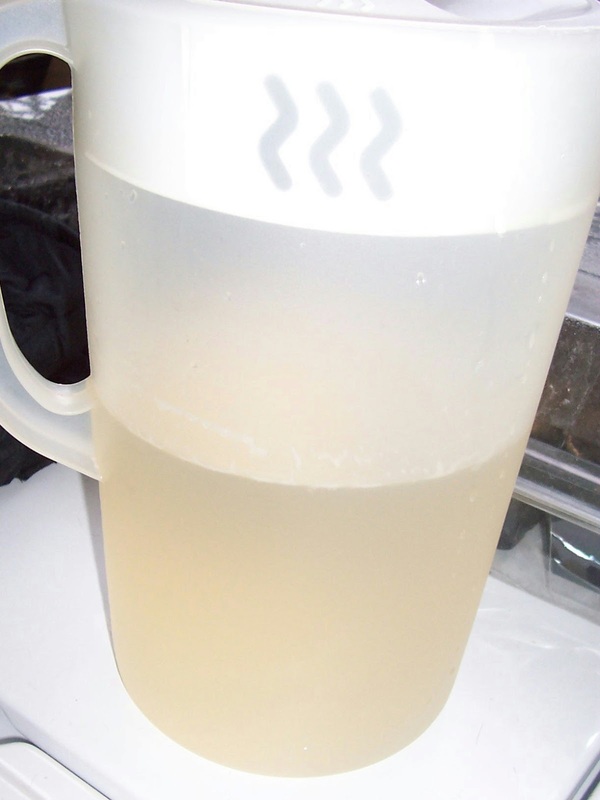 I made plain chaga tea before, but it was too long ago for me to remember to compare the two. 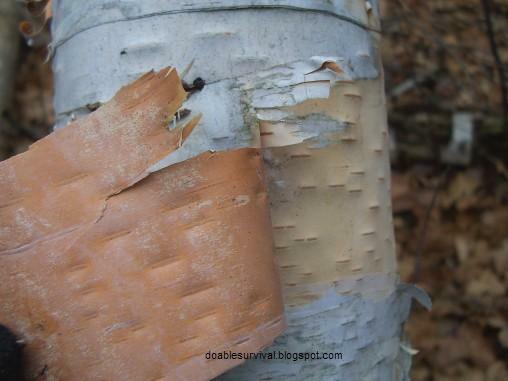 :) To me, the birch bark part is just a survival tip that is good to know; but some people harvest chaga because it is supposed to have health benefits. Chaga is really amazing! 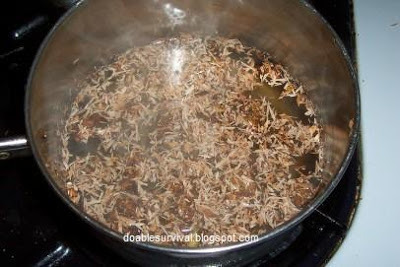 http://feelgoodtime.net/what-are-benefits-and-side-effects-of-chaga-mushroom-tea-inonotus-obliquus/ check it! Thanks. I'll check it out. 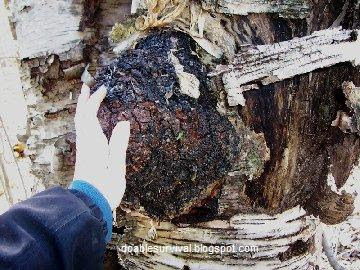 Chaga Mushroom also known as inonotus obliquus in scientific terms is a mushroom that grows on birch trees. 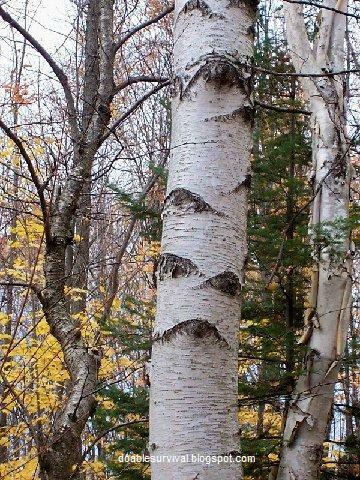 Unlike other mushrooms that draw their nutrients from the soil, this mushroom draws its nutrients from the birch tree. Other than drawing its nutrients from trees, another unique feature of this mushroom is that it’s usually hard instead of soft like other mushrooms. 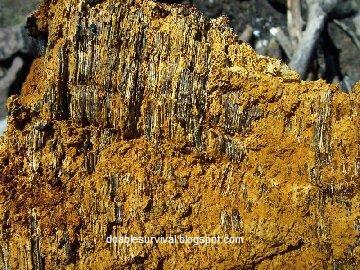 The insides of chaga have the color of rusted iron and the veins are cream-colored. The texture of the mushroom is cork-like and it has a charcoal-like appearance. Hey great Blog on Chaga man! I utilize a Triple ethanol extraction to break down the chitin layer more effectively.....there is a problem with people living too far north in latitude.....a lack of Melanin....we are supposed to be much closer to the equator, where our Hormone systems are kept at optimum. Chaga is an adaptogen and Melanin is also vital in hormone activity....take Chaga in conjunction with a diet balanced in a rtio of around 2:1 or 1:1 of Omega 6: Omega 3 fatty acids....this will help to aid absorption and utilization, protecting you from Cancers and massively fortifying your immune system! Keep up the good work, we need to spread this data to people, Allopathy is killing people!! Invented by the natives of North America. 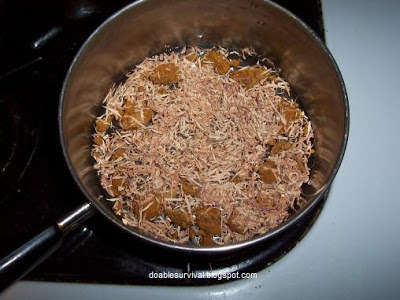 Pemmican was used by Indian scouts as well as early western explorers. These people spent a great deal of time on the go and depended on having portable, high-energy, highly nutritious, and filling foods that would last for long periods of time without refrigeration. 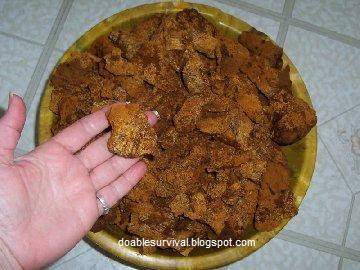 Click HERE to Learn How to Make Pemmican The Ultimate Survival Food ! How folks 150 years ago did it! These guys were the last generation to practice basic things-for a living-that we call survival skills now. 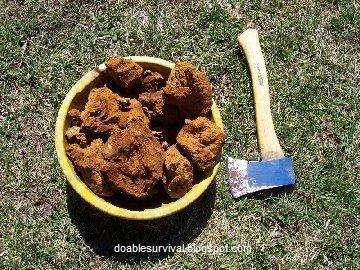 Survival Things Our Great Grandfathers Did Or Built Around The House! DIY Oxy-Clean Really Worth It? Simple theme. Theme images by jpique. Powered by Blogger.